You are here: Home / Art Techniques / Collaborative Dragon! 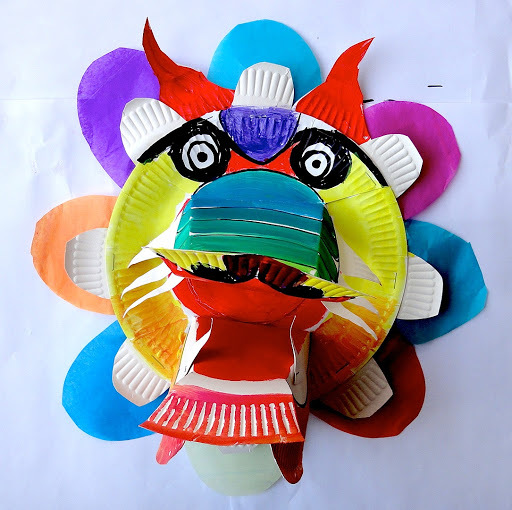 To end with flourish the topic about China with the students of 6th Year at Cherry Garden Primary School we have made a great Chinese dragon using paper plates. 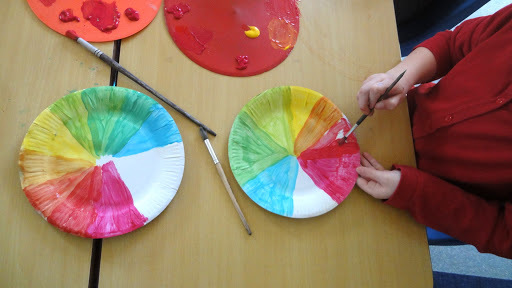 Each one has painted her paper plate as a color wheel, using only the primary colours and obtaining secondary and tertiary colours. 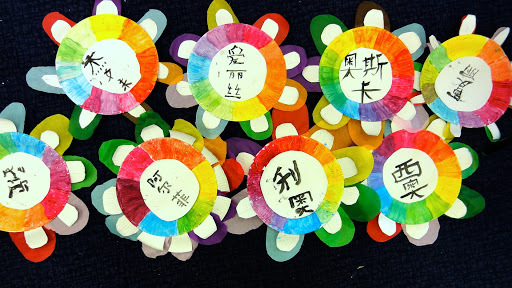 In another paper plate each one has painted her name in Chinese, this has been glued to the center of the colored plate, and the white edge has been cut to make some petals. Other petals have been cut from tissue paper and stuck on the white petals. 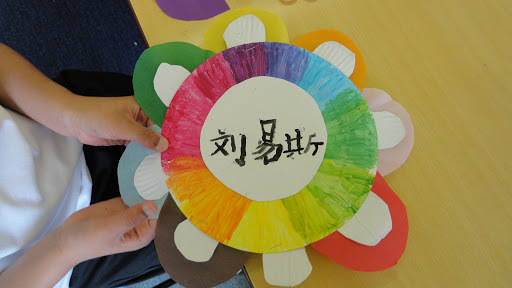 At the end of the work, each student has realized his “flower”. 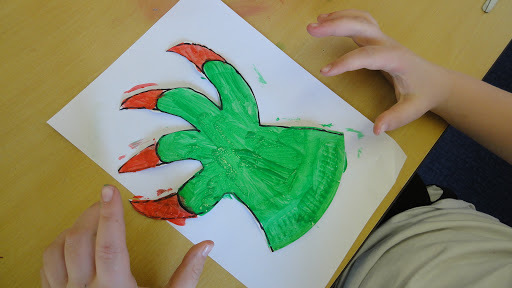 The head and paws of the dragon have been made with other paper plates and then painted with tempera. 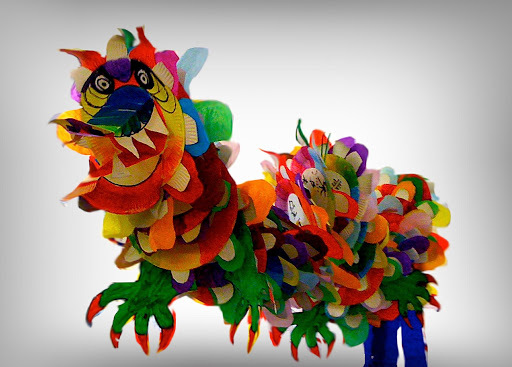 A long rope was inserted in all the dishes to form a long, colorful snake … and here is our fantastic dragon! A special thanks to the wonderful Year 6 teacher, Ms Formoso!! Ciao Miriam, grazie per essere passata e del bel messaggio! Fai davvero delle cose splendide ed il tuo blog è un gioiellino! Verrò spesso a trovarti! :-)Buona gionata! 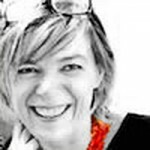 Grazie del messaggio Clara! Allora ci incontreremo in rete! A presto! Simply amazing!! How many students worked on this, or how many paper plates did you use? The dragon is SO impressive! Hi Miss March! 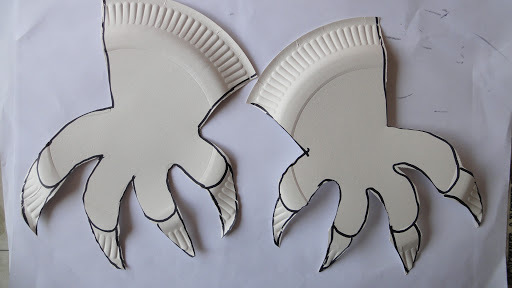 In this class students are 23, but we did some more plates (27 in all) and we add the plate with the dragon head. Between the plates we put tubes of pasta (penne) for separating a plate on the other. Thanks for your comment!! This is beautiful work. Did you tie it to any specific art history period, artist, or cultural celebration? Did you complete the dragon head yourself or were your students able to do this piece as well? 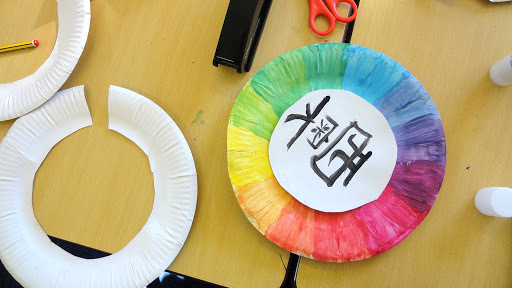 I’m thinking I might try a modified version of your project with my elementary students for Chinese New Year. I love this Dragon! 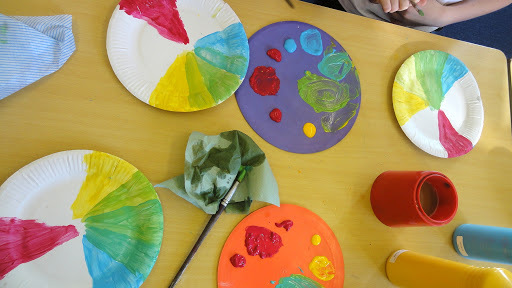 I understand this was an older class but Im hoping to try a rendition of this with my Year Two Class. Anyway I think this is a very special dragon.Congratulations to you and your class!!! We’ve just finished it. We made some slight adjustments and it looks awesome. Thanks again! I would like to see your work! Please, may you send me a picture? we’ll pin it on Pinterest as well! I am so excited and will be trying to do this for craft with an IM class. I think they will find it amazing and enjoy the activity. I am an Art Teacher in Arkansas, USA. 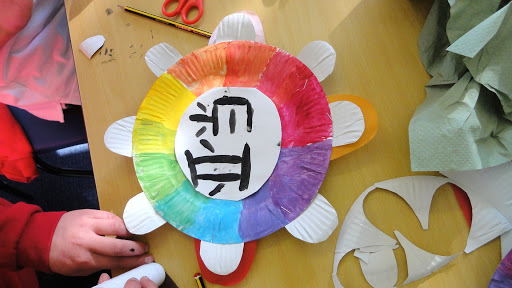 We are currently doing projects celebrating Chinese New Year! I plan on ending my unit with this! Thanks for the inspiration! This looks great! I was just wondering where you punched the holes to put the string through. Did you just do one in the centre or two on both sides? I really want to do this activity, but I want to make sure I know how to put it all together. This is just amazing. 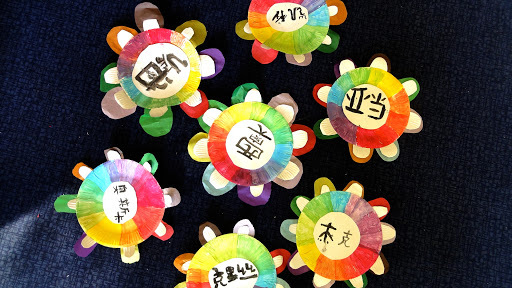 My three and four year old preschool classes are celebrating Chinese New Year at the end of the most and this would be a fabulous project to incorporate into our day. One question though, how did you affix the petal looking things onto each plate? How did you know how to write the children’s name in Chinese? Thank you! I did this project with my 3 and 4 year old students. It came out beautiful!! Thanks for your ideas! We did this in our homeschool – 3 students and 1 mom teacher! I love how it turned out! How long did it take to finish the dragon with 23 students? Hi Kaishi! 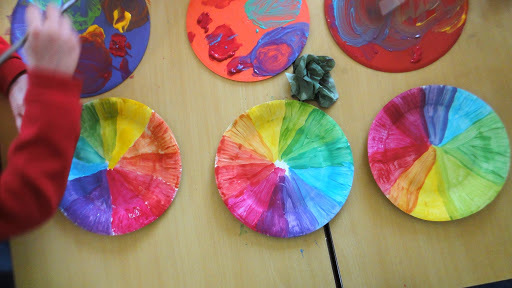 It took about 3 lessons 6o minutes each, one for plates, one for names and petals. One group prepared the paws and another has decorated the head. Another hour to assemble everything… what do you think? Thank you for the wonderful project! 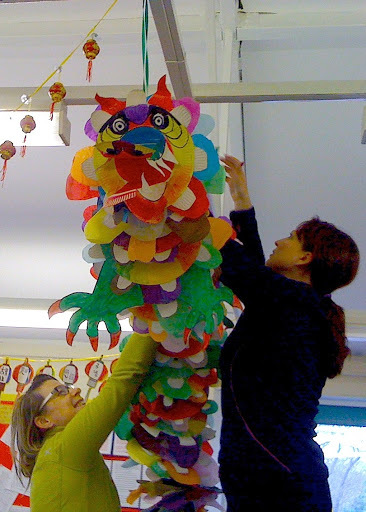 I am a coach and was watching a teacher and her ESL students working on the “Chinese New Year” project – we all enjoyed it immensely! Hi Lucy! Nice to meet you! I’m very happy to know that this idea is useful for many teacher, especially if you enjoyed it! Thanks for your comment! Thanks for this great project. I did it today and the kids loved it. One question: When assembling the dragon, how did you get the plates to not collapse onto themselves? I put in a piece of pasta (the ends are angled and not flat) on the yarn between the plates, and the plates fold down onto themselves like dominoes. Do you recommend a flat edged piece of pasta? Did you hang it in a special way? Any suggestions appreciated! Thanks for such a fun project. Your dragon is amazing! 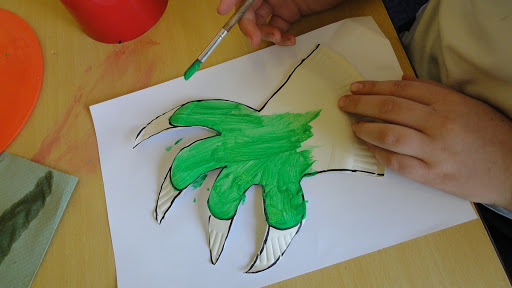 I would like to do this project with our 140 or so 3rd, 4th, and 5th graders…we will definitely have a long dragon! :0). I saw your tip about putting a piece of penne pasta between the plates when threading the plates into the rope…great idea! Do you have any other tips? I saw one person comment that the plates fell over onto each other on the rope, I’m wondering how to prevent that from happening. Do you have any photos that show the dragon from the side? I would also be interested to know what you did for the tail! It seems as though most Chinese dragons have a flame type of end to the tail? And on the head…I couldn’t tell from the pictures…but did you do hang whiskers or beard? Any tips or suggestions you have would be very very appreciated! I’m so excited to start this project! Thank you so much for sharing it and for electing us be inspired to do a similar project with our students! Did you receive my email? The pictures that I sent you are the only ones I’ve found. I didn’t fint details of the tail better than those. how do i do the face?? Total last minute here! But I love this and am hoping to do this with my class this week! Shopping for material tonight! Gracias! Thank you so much for this creative and beautiful project. 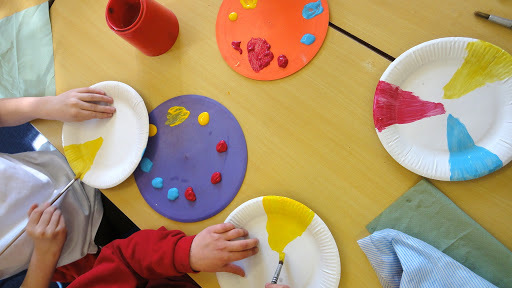 Children learn so many skills from collaborative works. 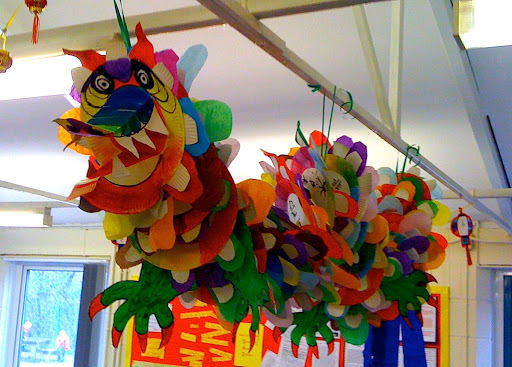 We are finishing the dragon tomorrow in my second grade classroom as our celebration of Chinese New Year. I will post of photo when it is hanging! Thanks for the great idea!! Miriam, our school program is hoping to get this project in motion for February, in time for Chinese New Year. We are thinking of arranging this bulletin style on a wall. any suggestions? obviously, we can’t have it hang due to setting off any motion sensors. My email is rweld6@comcast.net. Hoping to hear from you. Love the idea. 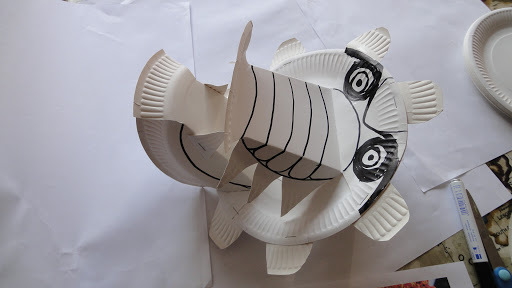 I love your project and want to start it today for my Chinese New Year unit. I am working with 3 rd grade boys and am the art teacher. Can you send me pictures of the tail you described. Thank you so much for sharing it with other teachers. This is wonderful!! 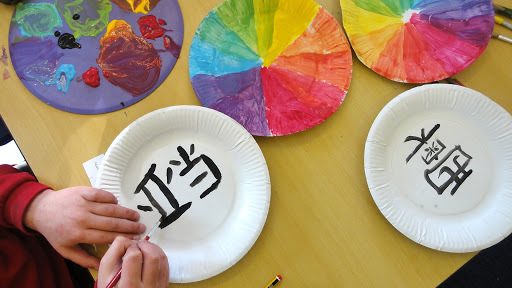 I was looking for some inexpensive decoration ideas for my 6 year olds chinese theme birthday, and this is terrific! It’s great to have something that my kids can help with making as well, so many ideas are too complicated for little hands.